as Mao Tse Tung or Kim Il Jong? Politics is a rough game, they say. The current president of Croatia, Ivo Josipovic, might have a lead as a favourite presidential candidate at coming elections according to surveys, which at best are left-leaning vessels trying to shape public opinion rather than reflecting the real opinion, but just have a peek into a couple of those anti-Croat independence tropes and symbolism he has dished out. It was February 2012 when, mean-spirited, he began using the word “snake” in talking about World War II Croatian fight for independence, trying to characterize everyone in that movement as Nazi/fascist driven extermination of Jews. Of course, his hatred for the communist camp he supports, if for nothing else then because his own father/family are said to have headed the Goli Otok (Naked Island) torture and false imprisonment camp Yugoslav communists held for decades to shut out innocent people who did not agree with communism, is nowhere to be seen. His reactions to numerous endeavours for the prosecution of Communist crimes have at best been insignificant. He pinned no “nickname” such as a “snake” to communist criminals even though, judging by the numbers exterminated/murdered by the communists, the word “snake” would be too mild to describe communist crimes. Indeed, he went out of his way to try and stop the recent extradition to Germany of two former communist secret police operatives (Josip Perkovic and Zdravko Mustac), who are to be tried next month in relation to murder of Croatian national in early 1980’s. This kind of hatred that attempts to equate those who fought for Croatian independence goes way beyond ordinary politics and deep into the realm of abnormal psychology. In its full-blown manifestations, it is akin to what an ophidiophobe feels at the sight of a snake: visceral and existential; categorical and absolute. It turns on the gut certainty that your adversaries aren’t looking just to raise your taxes but to destroy your whole way of life: that they are not only wrongheaded, but preternaturally evil. Comparatively few people experience these feelings on a conscious level, but they lie latent in many more of us than we might suspect and the coin turned to pro-communist symbolism, the danger for Croatian democracy is alarming. Similarly, his often-found symbolic words or gestures leave no doubt that his message is: you defend communism (or at least communist Yugoslavia) or your life will not really amount to much. Ivo Josipovic has for some months been a busy man in his evident associations with attempts to belittle his opponent Kolinda Grabar Kitarovic and even though the official presidential election campaigns have not started (it is anticipated that presidential elections will be held either late December 2014 or January 2015) he has been a busy with fear and loathing of anyone who would stand in his path to a second mandate as president of Croatia. The attire he chose for his latest visit to flood affected Karlovac (Saturday, 13th September) leaves nothing to the imagination – it was a definite statement of loyalty to communist regimes; it was a definite statement: you like communism or else! Why else would he dress in the way that reminds one of Mao Tse Tung or Kim Il Jong! Surely, even a child would see the symbolism in the clothes he wore during this pre-election campaign time, let alone a grown up who has decided on how he will conduct himself during the election campaign months ago! When we look at the fact that political loyalties secure jobs and other favours within the Croatian society governed by the Social Democrats, political party Josipovic left as active member as he headed for the presidential office, who sprung out of the Communist Party, his attire in Karlovac sends shudders into the thoughts as to what another mandate under his presidency might mean. Many argue that the values of democracy and independence are being systematically eroded by political elites in Croatia, especially those who have not, even after more than twenty years since the war of independence from communism, found time and efforts to discard the atrocious past of communist indoctrination. Many argue and protest against the palpable pressure to conform to the political elites and fear for their own well being if they dared to speak against those in political power. And so, the hopes lie with presidential candidates such as Kolinda Grabar Kitarovic, who will know where to place and how to deal with Croatia’s unfortunate political rut and raise true values of democracy where they should be. The rabble-rouser Alex Salmond always wears a suit and tie, but is shouting contempt and hatred for his opponents before our referendum on Thursday. Why would Tudman dress in marshal uniform since you claim he hated Tito,he was born biggest Democrat and human rights loving dude. It’s called marshal uniform ,mostly worn by Tito,Gadhaffi,Mubarek and rest of the crew,I haven’t seen any western leaders wearing it. Tudman was Vrhovnik as you might know,Why would he wear navy uniform when we didn’t have navy at the time.A dude was Vrhovnik and you should keep that in your mind all the time. In case you didn’t know Tudjman was a General and he was fighting a war! Guess the matching shirt and pant look is popular with these guys! Love the photo…LOL. Grown man in his pyjamas or leisure suit when all around him is chaos…and the comparison to his communist idols is spot on! I hope this picture gets circulated in Croatia. 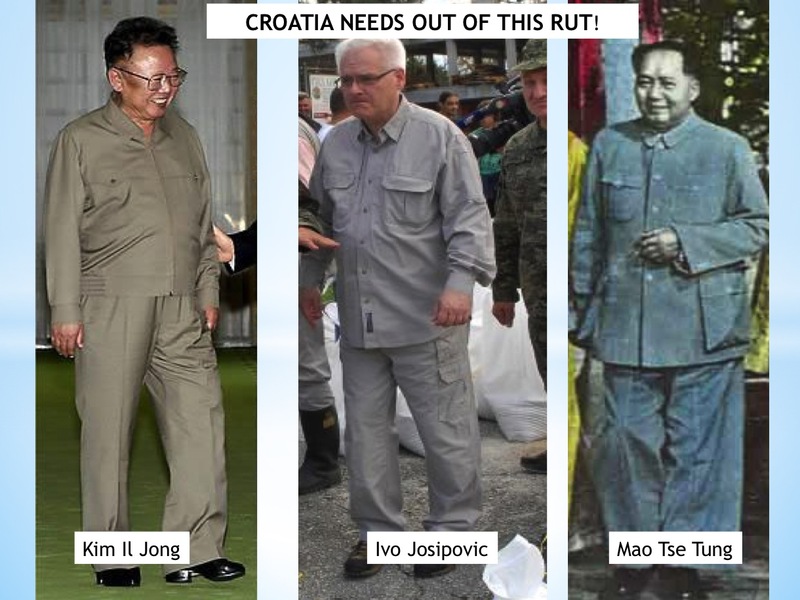 Thanks, Sunman – knowing Josipovic’s political leanings one cannot escape the symbolism in his “suit” especially at these pre-election campaign days but yes in addition – chaos all around him from flood and devastation and he goes in dressed like that! There is no doubt that Ivo Josipovic is a disgusting, contemptuous individual. Americans like to say you cannot have your cake and eat it too. In Australia we like to say you cannot sit on the fence. Mr Josipovic has to decide whether he is a democrat or not. Whether he is for free markets or not. Whether he is for European values or not. You cannot say you are for all the above and then in the same sentence profess you undying love for Josip Broz Tito. You cannot cherry pick JBT. You want him you take the lot. That means mass murder, concentration camps, expulsions and economic collapse. Croatia is in a world of hurt not because of Tudman or Ante Pavelic. It is JBT and his supporters who must accept responsibility for the economic collapse of Yugoslavia and the vicious Serbo-Croat war that was to follow. I just want to add one more thing. Mr Josipovic is behaving like this because Croatia’s constitution allows him to do it. The framers of our constitution have inadvertley created two centres of power in the country by allowing citizens to elect the President by popular vote. We should have adopted the German model where the President is elected by the Bundestag. The Chancellor is elected by the people directly. Your readers may not be aware but this why the vote for a Australian Republic failed. The electorate could not decide on how to elect a President. By parliament or the people. So Croatia, in typical know all fashion, decided on a popular vote and as any Constitutional Monarchist, would have foresaw, it has ended in complete disaster. The office of President is the single biggest cause of instability in the country. My heartfelt congratulation to my compatriots on this master stroke. Ante Saric,is there a reason you don’t want to mention Vrhovnik Tudman and HDZ or you maybe want us to believe how Josipovic and Tito have everything to do with Cro constitution so there for we can keep blaming them and udba for every single problem facing us and the country. …if, just ONE more TIME, if the Croatians vote in communists (who being stupid and naïve Croatian politicians, they don’t even know or how to lead a “communist” party), then they should be totally destroyed as an entity and a people! No mercy, this time, as the Serbian Chetniks (who are better politicians than the British) should take over ALL of Croatia and destroy every catholic church and any identity of the Croatian people! If these people are so stupid to vote in loser “communists”, than they don’t deserve to live on this planet! Hopefully this won’t happen! I am not well versed in world politics finding those of my own country disturbing enough. But I must say, it is incredible how tyrants seem to like these pajama suits….sartorial horrors among other types of horrors. I thank you for following my blog and hope you will visit often. it is a mishmash of a blog, but I enjoy it and try to use it to make people smile or share some light with them. I hope you will visit and find a smile! RT News is a great news media outlet I enjoy watching because they are truly balanced and report what most news outlets don’t. Their documentaries are first class. On October 22nd, they will be doing a Documentary on Yugoslavia, and how it actually fell apart. I advise everyone to watch it, I am sure there will be things in it that most people will not agree with or will find hard to believe. I don’t get involved in politics because I know what the game is, but for those that do follow it, this is a good time to see the other side of it, the true side, the real side and who really broke up Jugoslavia (Yugoslavia). A suit does not make a man. His actions and accomplishments do. What you see on the outside is not what reflects on the inside. Ivo is just a puppet in the play, he does as he is told and so does everyone else. I am still baffled and confused why the Croatian people fought so hard for their freedom and independence and then sold out to the EU. Our condition now is worse than communism was..at least that is what people tell me. I moved back to Croatia in 2004 so I was not here during those times.